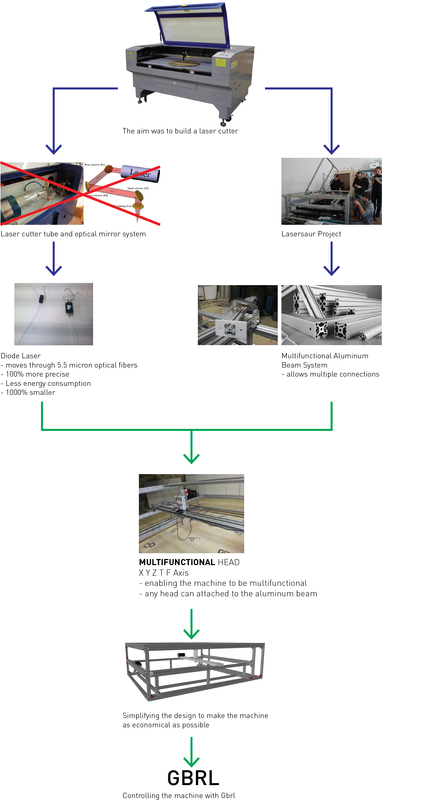 The aim was to design a laser cutter as economically as possible (~4500 euros). During my research, which included studying other open source projects, I became aware of a new kind of laser — a diode laser — which can move through optical fibers. This enabled me to have a free-standing multifunctional head while also making the machine smaller with the most up-to-date technology. Using a a small diode laser gave me more working space, consuming less energy, while at the same time being more precise and less expensive. The process was amazing. I designed 7 versions of the machine, each one building on the previous stage, resulting in a better and less costly machine. I succeeded in finding a good solution for the movement of the axis. The machine design includes electronics — design, implementation, and control — as well as programming. The machine is controlled by the GBRL CNC program. I received the laser only yesterday and am still waiting for some material to arrive in Israel. This project will continue to develop over time.